Hall Piano expands 4th annual Santa & a Steinway event to Children's Hospital on December 16th. Hall Piano Company invites families and friends to come see Santa perform on a Steinway grand piano at Children’s Hospital on Friday, December 16th, from 10:00-11:00AM. In addition to their traditional in store annual “Santa and a Steinway” event, Hall Piano added the Children’s Hospital program featuring New Orleans Piano Professor and Steinway Artist Matt Lemmler. The event is sponsored by Hall Piano Company, Louisiana’s premier Steinway & Sons dealer, located at 901 David Drive in Metairie. In addition to piano lessons, Hall Piano’s services include piano sales and rentals, acoustic and digital piano sales, and method books. Adult lessons are also available. 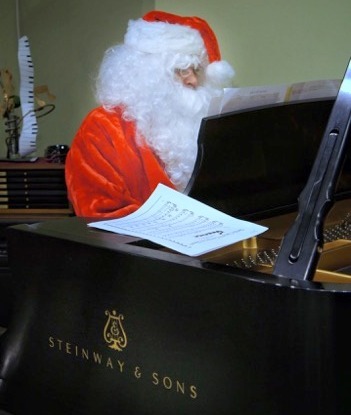 For additional information about Hall Piano Company and the Santa and a Steinway event, contact Emily McWilliams at emilym(at)hallpiano(dot)com or call 504.733.TUNE.